This is a much awaited post for many people who have asked me tips for soft and spongy idlis. So for all the idli lovers out there (especially who live outside India in cold countries) , this post is for you. Idli is a very common affair in any south Indian household and to be specific in Tamilnadu. Everyone has a separate grinder for this, which I know is difficult to get abroad. Now people out there who makes Idlis so easily in hot temperatures may laugh at this post thinking if even a post is needed for an easy peasy recipe like Idli. But I Know and can understand the pain and the cravings for this soft and fluffy Idlis for people living in cold countries. When I moved to London, making Idli was like a nightmare for me. I don't like eating outside either as it never matches the taste and texture of homemade Idlis. Without having a mixie initially, I survived for few months without them. 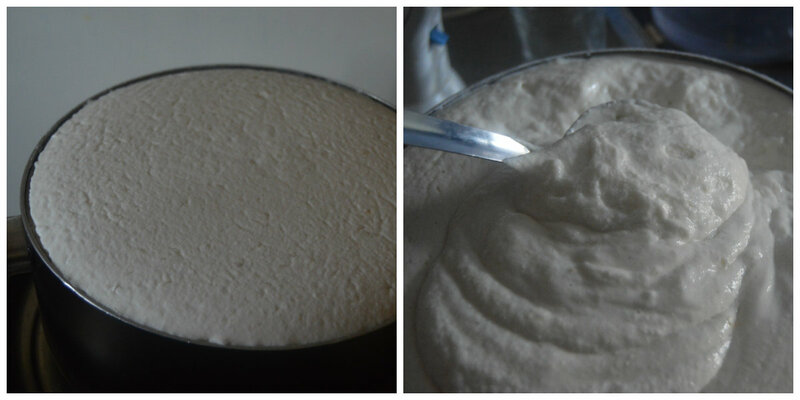 And then got a mixie, but my batter didnt rise even a centimetre.. :(. The rice was the problem, couldnt get idli rice or sona masoori in local stores. And then the temperature , the main villian. 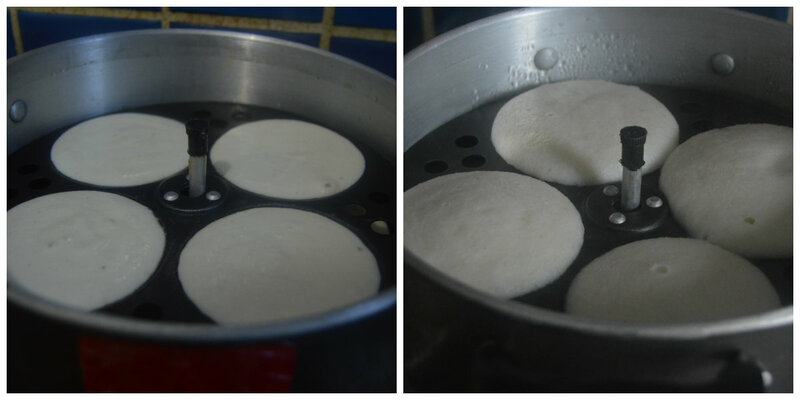 After all this hurdles, and experimenting a couple of times, now I enjoy super soft spongy and fluffy Idlis at home. Okay.. enough of my Idli stories.. Now to the recipe..
And.. Do not forget to read the points in NOTES section below. 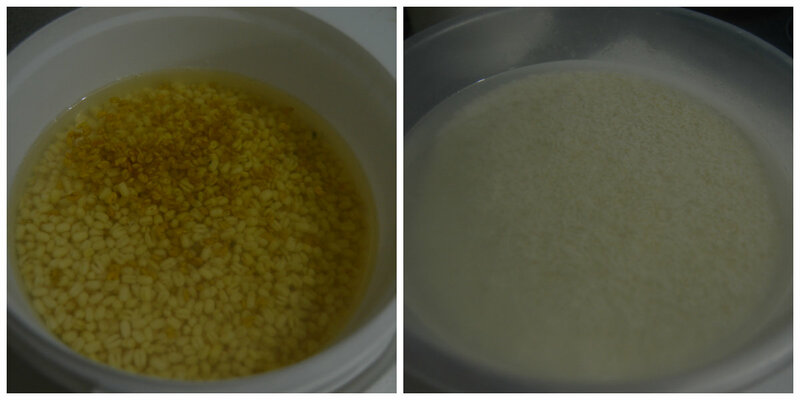 Soak the urad dal (with fenugreek seeds) and the rice separately for 4 - 5 hours. then grind the rice adding water to a smooth batter. 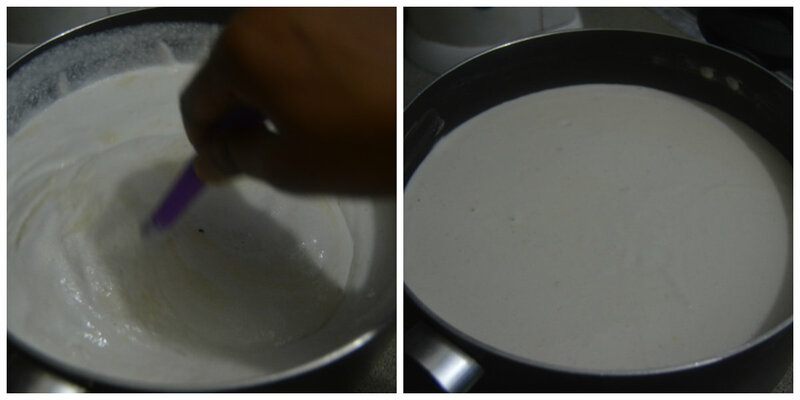 Add the ground rice batter to the urad dal, add salt and mix well. Mix well so that the rice and urad dal gets incorporated well together. Use a spatula to do this. You can do it with hand as well. Close the vessel with lid and place it in front of a heater. 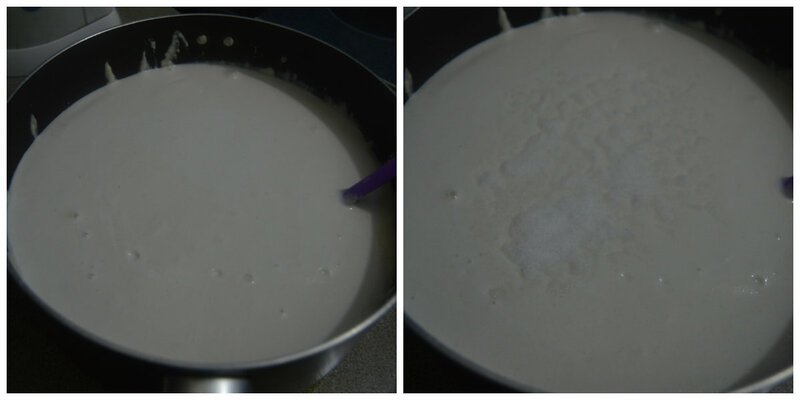 The second picture is after 10 hours, you can see the batter has risen well. Now this is after 12 hours, it has already reached the rim of the vessel. 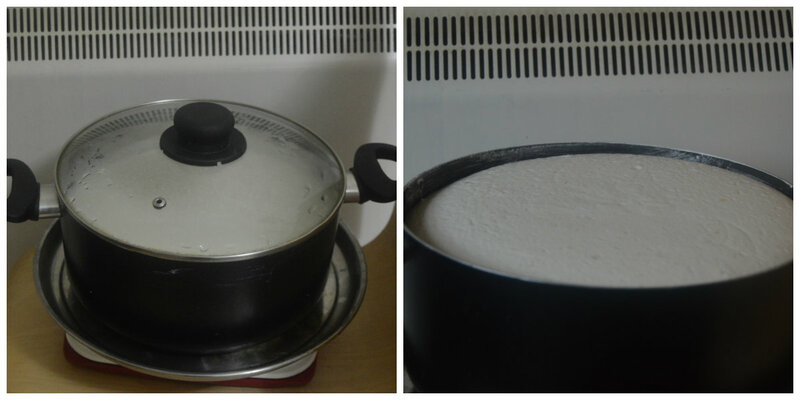 I had to shift some batter to another vessel allowing it to rise further without overflowing down. The batter should be airy and fluffy like shown in second pic indicating ti has fermented well. 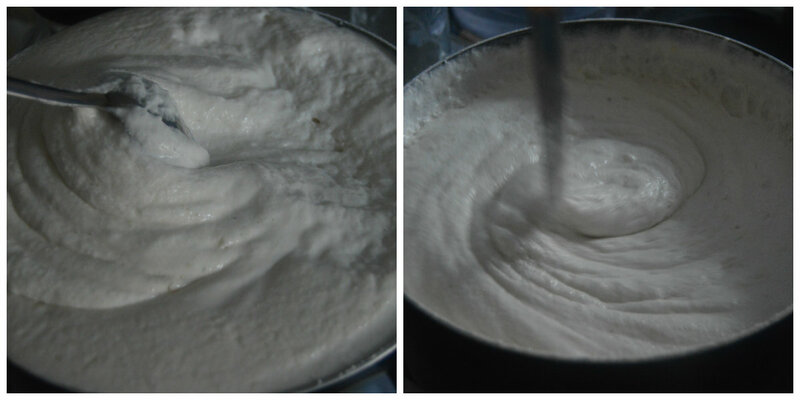 It is time to place the batter in the fridge, otherwise it will be over fermented. 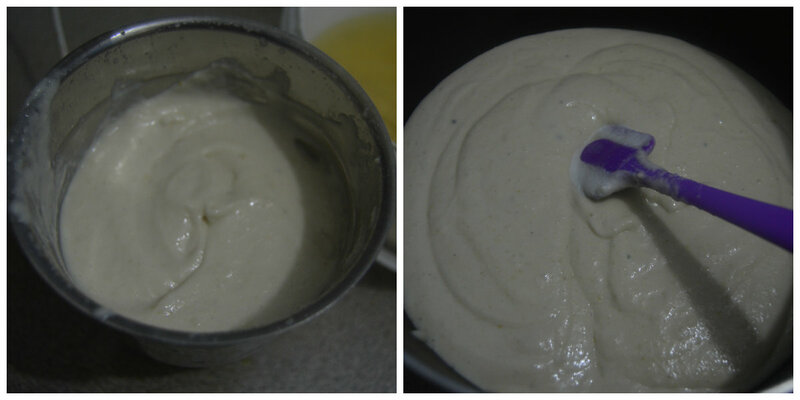 When you want to make idlis, remove the batter from the fridge, and keep outside for 10 minutes and give a good mix. Pour in the greased idli moulds and steam for 10 - 12 minutes or until a tooth pick inserted comes out clean. My idli plates are non stick, so I haven't greased them with oil. Do not remove the idlis immediately, give them 4 - 5 minutes and then remove with a spoon. Instead of mixing normal rice and idli rice, you can make idlis only with idli rice too. Some people add idli rava or poha etc claiming only then they get soft idlis which is absolutely untrue. in most of the households in Tamilnadu we never use any of those. Its just rice and lentil with fenugreek. Enjoy your hot idlis with sambar or any chutney of your choice. We generally serve with this Tiffin Sambar , Onion Tomato Chutney, Spicy Tomato Chutney or simple and delicious fresh Coconut Chutney. can we use rice flour instead of rice?